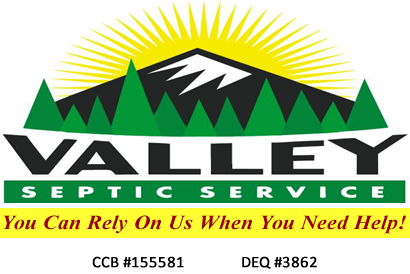 Valley Septic Service is a team of highly qualified professionals committed to providing quality service for residential and commercial customers. Our knowledgeable Office Staff and Field Service Technicians are dedicated to helping our customers become more environmentally conscientious and reduce costly repairs by providing management for their onsite systems. We are certified as an Operations and Maintenance Provider (O&M) by the Department of Environmental Quality (DEQ) and system manufacturers. We are licensed to pump septic tanks and perform inspections of your on site system. Our Service Technicians are knowledgeable, efficient, courteous, and will help you meet all current regulations and requirements. Advantex, Delta Whitewater, Biometrics Fast, Sand Filters, Re-circulating Gravel Filters, etc. Agate Beach, Airlie, Albany, Alpine, Alsea, Amity, Aumsville, Aurora, Belknap Springs, Bellfountain, Beverly Beach, Blodgett, Blue River, Brooks, Brownsville, Buena Vista, Burnt Woods, Canby, Carlton, Cascadia, Cheshire, Coburg, Colton, Corvallis, Cottage Grove, Crabtree, Crawfordsville, Creswell, Crow, Dallas, Dayton, Depoe Bay, Detroit, Dexter, Donald, Dorena, Dundee, Eddyville, Elmira, Eugene, Fall Creek, Falls City, Five Rivers, Foley Springs, Foster, Gates, Gervis, Glenden Beach, Goldson, Goshen, Grand Ronde, Greenberry, Halsey, Harlan, Harrisburg, Holley, Hopewell, Hubbard, Idanha, Independence, Jefferson, Junction City, Keizer, Kernville, Kings Valley, Lacomb, Lafayette, Leaburg, Lebanon, Lincoln Beach, Lincoln City, Logsden, Lowell, Lyons, Mabel, Marcola, Marion, Marion Forks, McKenzie Bridge, McMinnville, Mehama, Mill City, Millersburg, Mohawk, Molalla, Monmouth, Monroe, Mt. Angel, Mulino, Nashville, Neotsu, Newberg, Newport, Nimrod, Noti, Oakridge, Otis, Otter Rock, Peedee, Perrydale, Philomath, Pleasant Hill, Rickreall, Rose Lodge, Saginaw, St. Paul, Salem, Scio, Scotts Mill, Seal Rock, Shaw, Shedd, Sheridan, Sherwood, Siletz, Silverton, Sodaville, South Beach, Springfield, Stayton, Sublimity, Summit, Suver, Sweet Home, Tangent, Tidewater, Toledo, Turner, Veneta, Vida, West Salem, Waldport, Walker, Walterville, Walton, Waterloo, Westfir, Whiteson, Willamina, Wilsonville, Woodburn, Wren, Yachats and Yamhill.